A Village of Big Hearted people help us create our superb, new class. First, we had to select superb puppies. Donna Gleason, PSD Head Trainer, and Nancy Teague, CEO/Founder brain stormed on what to look for in a puppy. Of the 13 applicants waiting for our Service Dogs, 75% needed a dog to retrieve dropped items. Natural Retrievers needed. 75% of applicants are in wheelchairs. Dogs big enough to be easily stroked sitting in a wheelchair needed. A Service Dog has to WANT to help their person. People Oriented dogs needed. A Service Dog needs to navigate new situations, possibly crowded ones. Confident, friendly dogs needed. The 4 puppies our February 2018 puppies-in-training class have all these qualities. A LOT of people have helped us! Puppy #1 (Brooklyn): contrary to our model of using mixed breed Rescue puppies, we chose Puppy #1 from a litter of 7 at a breeder of Standard Poodles in Albany, NY. She approached us, wanting to donate a puppy to our School. We’d had requests for hypoallergenic service dogs, so jumped at the chance. Puppy #2 (Benji) and Puppy #3 (Bhodie). North Shore Animal League of America (NSALA), brought in a batch of puppies from Tennessee that fit our criteria. Donna Gleason and Nancy Teague chose 2 puppies out of the 6 the expert assessor at NSALA thought were the most promising. Not all the puppies immediately went to their puppy raiser. One of the puppies had treatable and very common issues contagious to other dogs. To protect its puppy raiser’s other dog, a vacation relief couple stepped in to care for the puppy while he was being treated with medications from our veterinarian. They had planned to go out of town for President’s Weekend, so another vacation relief person stepped in to care for the pup then. After our vet okayed the puppy going to his raiser, he did. Another puppy raiser had booked a 2 week trip to Australia long before she applied to join our Feb 2018 class. A vacation relief person kindly stepped in to care for that puppy the 2 weeks his raiser was gone. 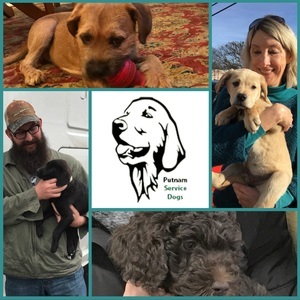 Training our puppies: Since all 4 raisers live in Westchester, and our Head Trainer lives in Sherman, CT, our training classes are held at Jesse Lee Memorial Methodist Church in Ridgefield, CT. The Church is very proactive in helping people with physical disabilities, building access ramps outside homes as one of their community outreach projects. Care of our puppies: Young puppies need a lot of veterinarian care - exams, stool assessment, parasite and other issues treatment, rounds of vaccinations, and microchipping. Mill Plain Veterinary Group, Danbury, CT with their 3 vet office meets all our needs with unfailing kindness, courtesy, and a discount. Feeding our puppies: Large dogs grow faster than small dogs, so our puppies need top quality nutrition to be healthy, have strong muscles and bones, and to maximize their length of service. Nature’s Select Premium Pet Food takes obsessive care over what goes into their food - using only locally sourced ingredients. They’ve never had a recall in their 27 years. We purchase the food directly online, from exception customer service reps, at a discount. They enthusiastically follow our pups on our FB and Instagram pages. Want to help our February 2018 class too? Please donate to help cover the puppies’ vet bills, training expenses, and supplies on our website at www.putnamservicedogs.org. Putnam Service Dogs is a registered 501(c)3 nonprofit corporation.